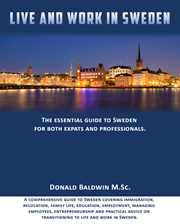 Live and Work in Sweden is organized into thirteen chapters designed to cover the important aspects that an expat needs to understand and take into account when moving to Sweden for work or to start a business. The book is organized into three sections: A Welcome to the book, thirteen Chapters and a Reference section. The reference section includes information on Annual Basis Rates and tax and legal issue examples oriented towards legal, accounting and management professionals.